Shot on the Upper West Side of Manhattan, Rooftop Serenade is about an unusual and fortuitous meeting between two people (Gretchen MacLane and George Vlachos) on the roof of their building. The soundtrack features the voices of Holly Leavy and Thomas W. Campbell, and original music by Mr. Campbell. 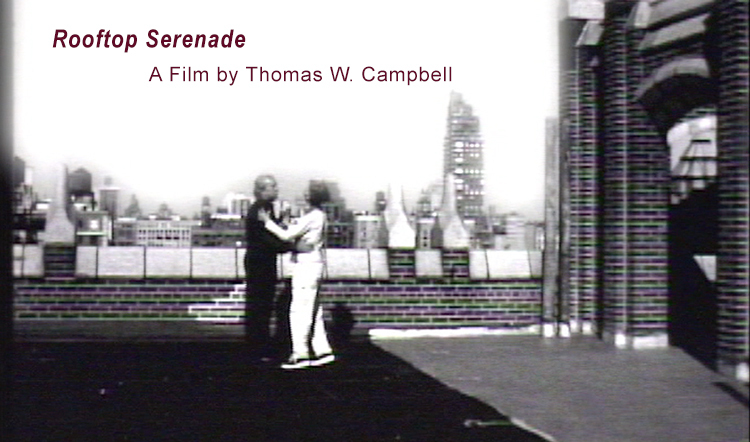 Rooftop Serenade was shot on a single roll of Kodak reversal film with a Bolex camera and is two minutes and twenty five seconds in duration. Update 1: I recently found the 16 mm master of this short film so will be producing an HD ProRes HQ version, based on a film to PRoRes transfer made through Color Lab. Update 2: The HD transfer of Rooftop Serenade played at the Extremely Shorts Film Festival in Houston, Texas in early June, 2015. It played at the Carnegie Museum of Art, in Pittsburgh, in July. Stills from the original shoot can be found here. This entry was posted in Digital Production, The Filmmaker's Perspective and tagged Thomas W. Campbell, Very short film by Thomas W. Campbell. Bookmark the permalink.